Among senior ministers and officials, there's quiet satisfaction that the Russia crisis seems to be going according to plan. Maybe even better. According to one senior government source, "it's gone at least as well as we'd hoped". He didn't add, "...so far, anyway". But then he hardly needed to. As Britain ponders its new post-Brexit role in the world, we're now witnessing the start of a new and defining phase. Judging the high and the low politics of the Russia crisis objectively, Theresa May and her team have been able to tick a series of boxes. So far, anyway. The UK sits front and centre of a solid front ranging from the EU through NATO and Donald Trump's White House. (Tick). The response of the US President was always the least predictable. But as one well placed figure told me: "The US relationship is about more than the contacts between our two principals. We have good lines of communication to people who are in the room with the President. They've been paying off." So a crisis which had the potential to divide the western alliance appears to have achieved the opposite. (Tick) So far, anyway. Ministers, I am told, are ready to escalate the level of action if Moscow's expected countermeasures are seen as "disproportionate". For Britain, these could include further expulsions, asset freezes against the Russian president's close associates - "the kind of people who have Putin on speed dial" - and more. There's no present wish in government to see the Kremlin funded TV network RT, formerly Russia Today, banned. It would ultimately be a decision for the independent watchdog Ofcom anyway. But Theresa May is said to be keener to pointedly demonstrate her support for the principle of free expression. Moscow's inevitable response to Britain's expulsions and planned sanctions will test the UK's resolve and the strength of the alliance against Russian aggression. At Westminster, MPs on all sides have offered unqualified support for Theresa May's response. (Tick). The most notable exception has been Jeremy Corbyn, backed by some but not all of his closest colleagues. From a Conservative point of view this perhaps merits a double-tick. In government, and among many Labour MPs and shadow ministers, the Labour leader is judged to have placed himself on what Tony Blair was fond of calling "the wrong side of the argument". No-one has conclusively proved that the Russian-made poison was administered by a Russian state assassin. But that is now the unqualified conclusion of the UK, its allies and MPs on both sides of the House of Commons. To the discomfort of Labour MPs who privately condemn their leader's equivocation about the identity and motive of the would-be assassin, MPs from the Scottish National Party and the Liberal Democrats have begun signing a House of Commons motion supporting Mrs May and blaming Moscow. There've been no resignations among Labour's team of shadow ministers, though a number have shared their deep sense of unease with friends and close associates. There's absolutely no sign of a repetition of the mass revolt among Labour MPs which took place before the last general election and which failed to remove the leader. Many members of that rebellion were subsequently heard joining in the chorus of "Oh Jeremy Corbyn" after the party defied all the worst expectations of Labour's performance. More settled into sullen acceptance of the fact that their party was now in the secure control of a leader and a strain of politics they had always opposed, or seen as irrelevant. Now, though, Labour is experiencing its most serious schism in thinking since the party split for and against launching air strikes against so-called Islamic State in Syria in December 2015. Mr Corbyn's conviction is unwavering. He declares he is pro-sensible caution, not pro-Russia. Simply opposed to a slide into a new Cold War. His close allies in the Parliamentary party are vitriolic about the disloyalty, as they see it, of fellow MPs. Lloyd Russell Moyle, MP for Kemptown called them "right-wing sods" who want to "beat the drum of war without a plan". Another, Chris Williamson, described the Labour MPs who had backed Theresa May as "baying for blood" and deserving of de-selection. For all the fiery rhetoric, the quiet, off-the-record muttering is perhaps more significant. Labour MPs who had become resigned, if not reconciled, to the leadership and the direction of their party are now saying they're unable to see how they can campaign to install Jeremy Corbyn as prime minister, with responsibility for the security of the UK. As one said: "Last time we could say 'vote Labour, and you needn't worry because Labour won't win.' Now what do we say?" So, a crisis in the Labour Party. Another one. But a quiet crisis. Theresa May and the Conservative hierarchy can sit back, enjoy it and hope to reap their reward in opinion poll ratings. Against the backdrop of global instability and a 21st Century Cold War, the latest upheaval in British party politics at Westminster may seem a little parochial. But it matters; a significant sub-plot to the wider drama. This week, NATO'S Secretary General spoke of a new order in which lines had been blurred between peace, crisis and war. It sounded alarming. It was also a fair description of the Her Majesty's Official Opposition at Westminster. 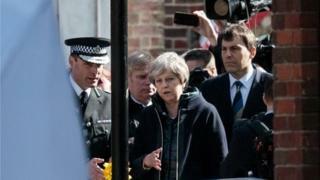 Video Poisoned ex-spy: Why does UK think it was Russia?